Meal Deal B - 12" Pizza, 2 Drinks, 2 Fries or Wedges from €18.95 at Papa John's 12" pizza, 2 regular drinks, 2 regular fries / 1 potato wedges. One of the world’s best-loved pizza chains, Papa John's offers fantastic, affordable, delectable pizza across nearly 5,000 restaurants globally. With humble beginnings in a broom cupboard in America, the pizza lovers of the world quickly developed a taste for what the Papa was cooking up. Since the get-go this restaurant chain has been striving to create better meals with better, fresher ingredients. 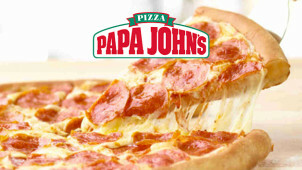 Offering truly delicious fare for great value, it’s no small wonder Papa John's has garnered such worldwide popularity. With exquisite savoury cuisine available for delivery or collection across dozens of countries worldwide, Papa John’s is a truly phenomenal pizza restaurant. Innovating and evolving since the get-go, Papa John’s was the first company to offer dipping sauce for its crusts, a trend quickly copied by many other pizza chains. With an astonishing variety of enticing pizzas on offer including classics like the Hawaiian and the staple Cheese & Tomato, everyone can find the right pizza for them at Papa John’s. How do I use my Papa John's offer? Enter your payment details and confirm! Sign up for Papa’s Rewards to receive loyalty points for every pizza you buy. Does Papa John’s have a gluten-free pizza? Unfortunately, Papa John’s doesn’t currently offer a gluten-free pizza for coeliacs or those gluten-intolerant. Do Papa John's offer a student discount? If you’re a student have a look here to see how much you could save from Papa John’s. Do I need to make an account to order from Papa John's? You can checkout as a guest with Papa John’s, but there are a number of benefits to registering an account, including saving your favourite pizzas. You can choose to either collect your pizza from your local branch or have it delivered to your door. If you cancel your order up to 45 mins prior to the start of the delivery window you will receive a refund in full, however no refund is given for cancellations made after this time. If you’re looking for delicious pizza at fantastically low prices you can’t do better than Papa John's, an all-American inspired pizza delivery business offering delicious cuisine at affordable prices. Use one of our Papa John's offers and save a pretty pretty on the price of your pizza purchase. For all the cheesy, tomatoey, doughy yumminess you could hope for, it’s got to be Papa John's. Make sure to eat your crusts. Papa John's was started out of a broom cupboard in Indiana back in 1984. Papa John Schnatter converted an old broom cupboard into a small pizza kitchen, but his pizzas proved so popular a year later he set up shop in a much larger premises. Today his pizza is enjoyed in more than 4,700 branches across 37 countries. This global popularity pays testament to how truly delicious Papa’s pizza really is! Pick up a Deep Dish Sausage & Pepperoni Pizza, certified as the Papa himself’s favourite on the menu. A delicious megalith of cheese, sauce and tasty, spicy meat, you’re sure to love this amazing pizza. Grab one of vouchercloud’s great Papa John's vouchers and get your pizza without breaking the bank. Order it for collection or get it delivered straight to your door, either way you won’t be able to leave a single slice uneaten.